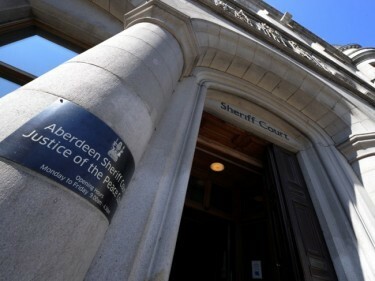 Alan Donnelly appeared at Aberdeen Sheriff Court yesterday, accused of sexually assaulting a man at a function in the Holburn Street area of the city on November 3 last year. It is alleged that the Torry and Ferryhill councillor touched the man’s face, hair and body on various occasions, and kissed him on the face. The 64-year-old denies the charge and will go on trial next month. Donnelly’s solicitor Jennifer Pritchard said: “The police in their statement refer to a DVD of the interview but that has not been disclosed, neither has the transcript. Fiscal depute Lucy Simpson said the Crown intends to question five civilian witnesses and one police officer, while Miss Pritchard said the defence was also preparing to call one witness. Donnelly, of Deemount Gardens, Aberdeen, resigned as depute provost in January after he was charged. His case is expected to call once more before his trial date, which has been scheduled for next month.